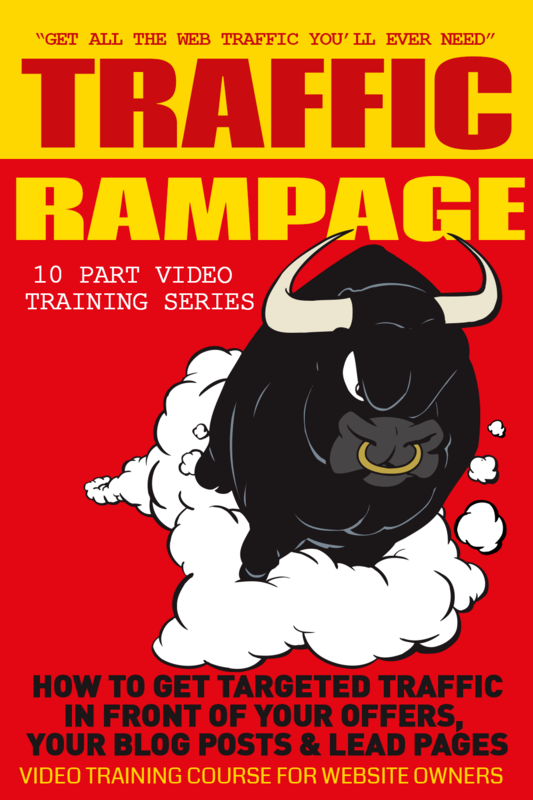 "The Best TRAFFIC TRAINING Videos You've Ever Seen - And Now You Can Use Them to Grow Your Business, Impress Your Customers... And MAKE MONEY!" You Can Get The Private Label Rights To A Set Of 2 TRAFFIC TRAINING Video Courses With Sales Videos and Email Swipes, Plus Promotional Blog Posts And More.. At Blow Your Mind Pricing! Whether you’re selling ebooks, software, garden spades, black socks, computer supplies, plastic vomit, t-shirts, services or anything else under the sun… this course will show you how to get the traffic you need so you can start making the sales you deserve. Video 1: Don’t Confuse Traffic Quantity With Traffic Quality - Inside this first video you’ll find out the single biggest traffic mistake that leaves you utterly frustrated with your results and wondering where you went wrong. This will be the ah-ha moment that turns you entire business around so you can start getting the traffic results you want! Video 2: Massive Traffic Made Easy - In this video you’ll find out the surprising ways top vendors create affiliate programs that everyone wants to be a part of. Plus you’ll find out how to get the super affiliates in your niche driving traffic to your site and slipping money into your pocket. If you have your own product, you don’t want to miss this video! Video 3: Siphoning Traffic From Social Media - Nearly everyone sets up Facebook pages. Quite a few marketers use Facebook’s paid advertising platform. But so many people overlook this third strategy – and yet it’s so powerful it can attract thousands of eager customers to you. You’ll find out what it is when you watch this video! Video 4: Get Your Buzz On - This video reveals how you too can get everyone in your niche absolutely buzzing and raving about your content, ideas, business and products.You’ll discover a simple four-step process for kicking off a viral campaign… plus you’ll find out an incredibly clever way to get more people than ever sharing your content. These are the same viral marketing secrets people use to generate hundreds of thousands or even millions of views, likes, comments and shares – just imagine your results when you put them to work for you! Video 5: Have Cash, Will Traffic - Free traffic is great… but it’s not truly free. No matter how you get your traffic, you’re always paying or trading something – like your time. That’s your most limited asset. And that’s why in this video you’ll find out two of the best ways to buy the traffic you need – it’s fast, it’s targeted, and it frees up your time. Video 6: The Secrets of Optimizing Your Existing Traffic - So many marketers let good traffic just slip through the cracks. It’s wasted. It’s like pouring a glass of liquid gold down the drain. Now it’s time to turn that around…This video shows you three surprising ways you can optimize your existing traffic and turn it into even more traffic, more sales, and more cash in the bank. These strategies will make a huge difference to your business this year, no doubt about it. Video 7: Turning Words Into Targeted Traffic - It’s no secret that well-written content can drive traffic and even kick start a huge viral effect. But did you know about getting a ton of traffic by asking others to guest blog on your site? You get free content, you get free traffic … and you’ll learn how to take advantage of this surprising traffic strategy in this eye-opening video. Video 8: Amazingly Simple Way to Get Traffic by Getting Involved - It sounds so simple, and yet it’s a great way to get a ton of traffic. All you have to do is insert yourself into the trending or even controversial conversations that are taking place in your niche right this moment… and within minutes you could be seeing a fresh batch of visitors landing on your virtual doorstep. You’ll get all the details in this video! Video 9: Are You Overlooking This Huge Traffic Source? What is it? It’s offline advertising. Inside this video you’ll find out the three best ways to reach your target market offline – these work so well, you’ll wish you had started doing them the day you launched your business! Video 10: How to Super-Charge Your Promos - Most marketers start getting a bit of traffic and they’re happy. This video shows you two killer tricks to take it to the next level. You’ll find out how to protect yourself from losing traffic, plus you’ll find out how to make more money for every ad you push out. It’s so simple, yet so effective! Your customers want more. More traffic… more subscribers… more customers… more cash in the bank. And now with this license you can teach them how to do it in the fastest way possible. Video 1: The Surprisingly Effective Shotgun Approach to Advertising - Even if you’re using a shotgun, you better still be taking aim before you fire. So when you use shotgun marketing, you aim, you fire… and your advertising campaigns effortlessly find their targets so you can generate more traffic.How do you put this highly effective traffic strategy to work for you? That’s what you’ll find out how to do inside this first video. Video 2: The Secrets of Renting Space in Your Prospects’ Heads - Here you’ll find out how to quickly obtain top-of-mind awareness in your niche, plus you’ll discover psychological tricks for establishing yourself as an expert – even if you’re brand-spanking-new to the niche.This strategy drives endless streams of traffic to your site day in and day out – it’s one of the most powerful ways to ramp up your business! Video 3: Persuading the “Sneezers” to Infect Your Niche - If you want to drive a lot of traffic without spending a penny in advertising, then you need influential people on your side… and this video will show you how, including the best way to get the right people buzzing about your products. Video 4: Amazing Ways to Leverage Other Peoples’ Best Assets - What you’re about to discover is how to get high-profile marketers in your niche to willingly giving you access to their prospects, subscribers and customers. You’ll even find out the #1 secret to landing JVs with the BIGGEST names in your niche – this secret alone is worth a bundle of traffic of cash to you, so you’ll want to pay attention to every second of this video. Video 5: How to Make the Most of Your JV Deals - A lot of marketers who’re new to joint ventures just ask their partners to promote products as an affiliate.You know what? That’s totally lame. That’s why this video will help you up your game with 8 super-profitable ideas for JVs that will deliver more traffic, more subscribers, and more sales to your virtual doorstep. Video 6: The Secrets of Mobilizing Your Affiliate Army Just one good affiliate can deliver thousands of visitors and hundreds of sales to you in a very short amount of time. And this video shows you how to find and entice the super affiliates of your niche to promote your products. Plus you’ll discover the #1 way to grow your affiliate program effortlessly – and you don’t have to lift a finger! If you like the idea of the best marketers in your niche clamoring to promote your product, then you’ll love discovering the affiliate growth strategies inside this eye-opening video. Video 7: Turning Lukewarm Viral Campaigns Into Wildfires - Here you’ll find out the secrets of viral campaigns that can turn your business into a household name. You’ll learn how to create content that’s worth sharing, the two best times to drop your content onto social media, and the secrets of generating a whole lot of sales after a contest is over. Video 8: A Clever Way to Get People to Send You Money AND Traffic - Sound too good to be true?It’s not. The secret here is to sell resell rights licenses for your products to other marketers, who then put your content in the hands of thousands upon thousands of their customers. Video 9: The #1 Way to Maximize Your Traffic and Sales - Have you ever noticed that some marketers almost always make money no matter what they do?It seems like voodoo magic, but it’s actually pretty simple... You see, the best marketers on the planet know how to track and test their advertising campaigns so they can cut the losers, while pushing the winners to the front. And now you too will find out what to test, how to test it, and how this simple little process will create more traffic, subscribers and sales for you this year. Video 10: How to Boost Your Traffic by Playing the Numbers - Throughout the program you’ll discover how to GET traffic… and now this is where you’ll find out how to capture it, keep it and make the most of it. Plus you’ll learn what “playing the numbers” means in marketing – and why this is your key to massive traffic. It’s time to take it up a notch. It’s time to rise above all the average Joe's in your niche and do something awesome. You’ll finally get some serious respect from your competitors, and you’ll impress the heck out of your friends and colleagues. ​In just a few minutes you’ll teaching your customers the tweaks they need to boost their traffic numbers, boost their revenue and boost their standing and authority in any niche. promotional emails/blog posts you can use to provide follow up training to your advanced course buyers, these are designed to add even more value to your training offer, minimize refunds and encourage 'students' to become affiliates and promote your basic course - Just add your affiliate page link and you're set! Add The Course(s) To A Membership Site. The content inside these courses is choc full of useful information. Any of it would be a valued asset in a marketing or business membership site. You get 20 videos in total and easily enough for an entire membership site or a year's worth of content ready to drip deliver every month.